I have been making fruit crumbles for as long as I can remember. 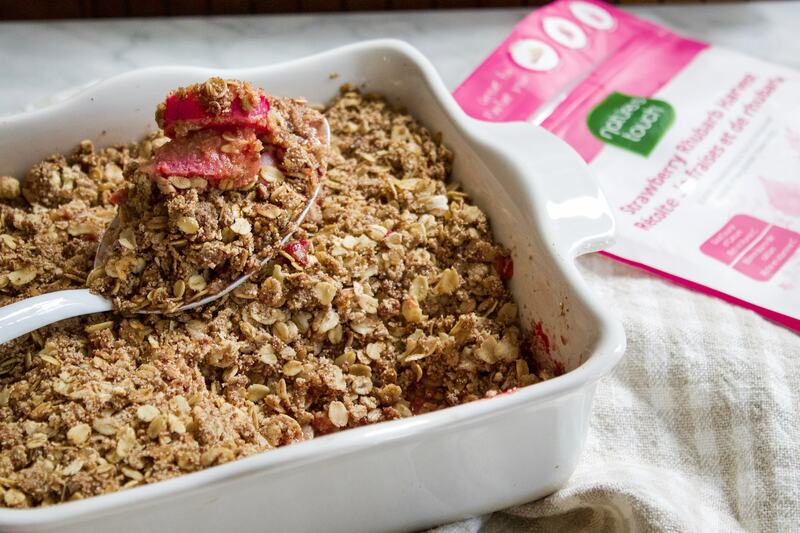 The reason why I call this recipe ‘fruit’ crumble is because really any type of fruit will work. I particularly love strawberry, blueberry, and rhubarb (or a mix of all three!). As summer comes to an end, our pick of seasonal fruits diminishes and we are left with months of eating a variety of apple desserts. Don’t get me wrong, I love anything apple, but it’s sometimes nice to have a strawberry dessert in the middle of January. Thanks to Nature’s Touch frozen fruits, we can easily make summer fruit desserts year round! 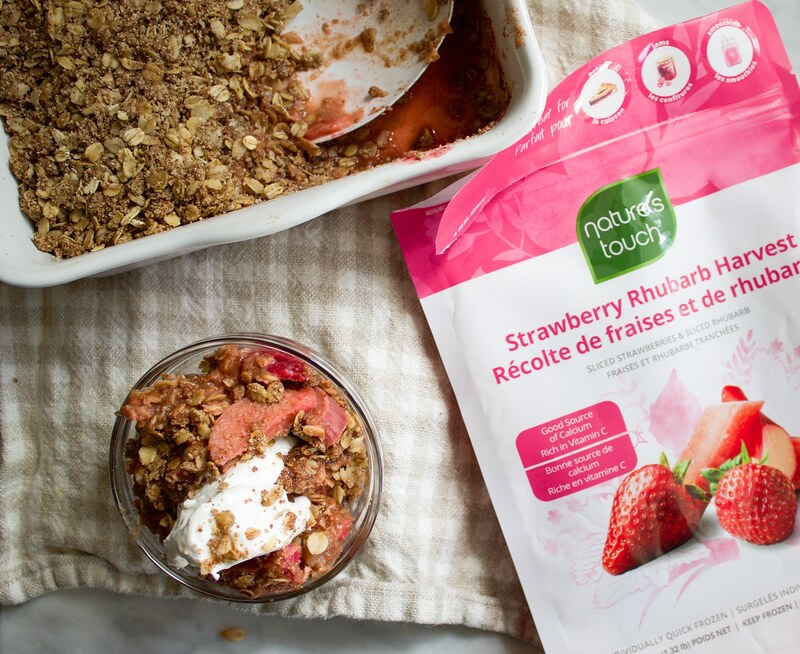 I particularly love their strawberry rhubarb harvest mix as you can simply open the bag and bake – no prep required! Natures Touch makes sure their fruits are free of pesticides and GMO’s and frozen at peak freshness. 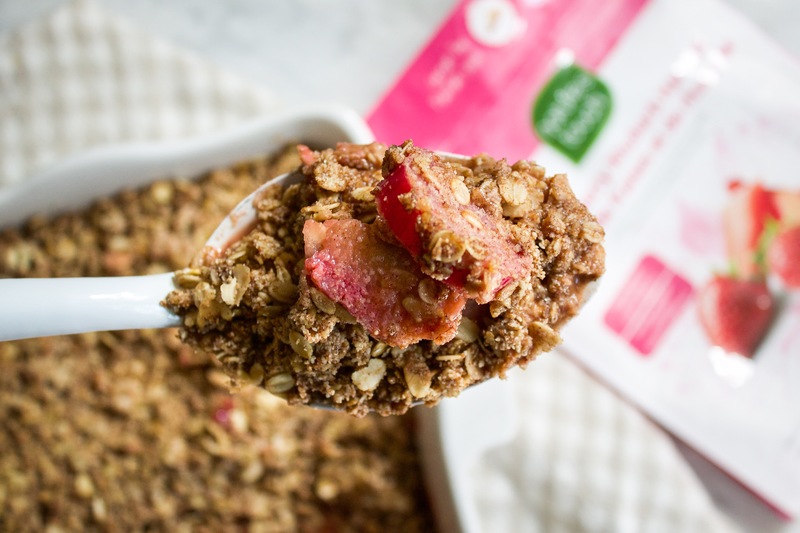 This healthy dessert is a perfect one to enjoy year-round and best of all, it couldn’t get any easier! *This post is brought you by Nature’s Touch, but all opinions are my own. 2. In a medium bowl, mix all filling ingredients and place in a shallow baking dish (approx 9 inches). 3. In a medium bowl, add your rolled oats. Using your fingers, work the coconut oil into the oats until it has completely absorbed into the oats. It’s ok if some chunks remain. This might take a minute or two. 4. Add your remaining ingredients to the oats and mix well. Spread topping evenly over filling and bake for about 40 minutes or until the filling begins to bubble and the crumble becomes golden. 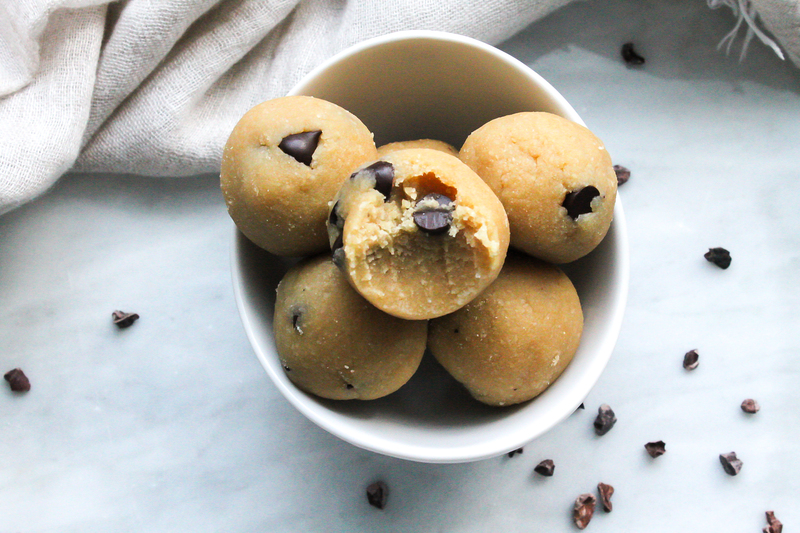 After seeing how much you guys enjoyed the No Bake Cookie Dough Bites, I knew I had to recipe test more simple desserts. With busy schedules, it is nice to make a dessert that requires no baking, minimal ingredients, and only one bowl! 1. Line an 8 x 8 baking pan with parchment. Set aside. 2. 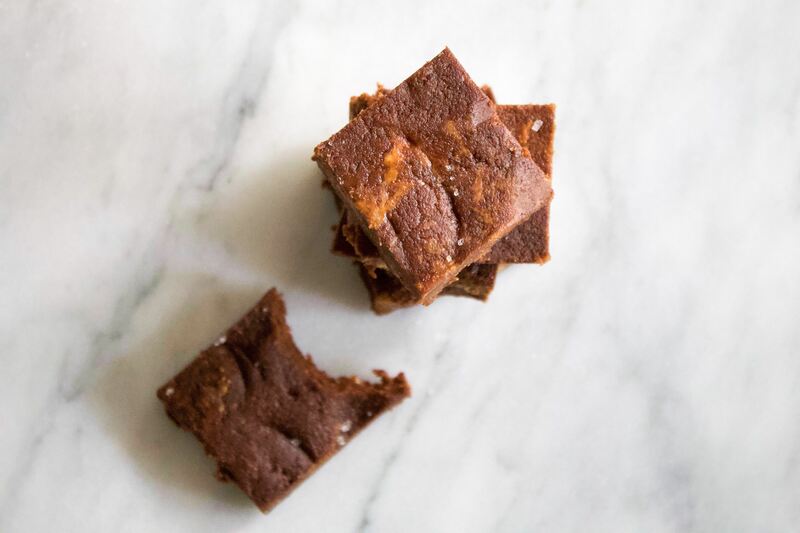 In a large bowl melt your coconut oil along with chocolate. You can do this over a shallow pot of boiling water or in your microwave. Whisk until smooth. 3. Mix in vanilla, maple syrup, and cacao powder. 4. Add your almond flour. Add additional tbsp until a dough forms. It should be firm. 5. Mash in your peanut butter. If you want to see the peanut butter in your brownie, make sure not to overmix. 6. Press into your prepared pan and top with extra salt if desired. Set in fridge for 30 minutes. Remove and slice. Store in an airtight container. This will be my last recipe post for 2017, and it will certainly end off the year on a sweet note! This recipe was a personal request from you via Instagram poll, and I worked hard to get it right. I really wanted a ‘ball’ or ‘bite’ recipe that required no food processor. I find there are so many moments when I want something quick and sweet but don’t feel like busting out all the machinery. These come together in less than 5 minutes in 1 bowl and require only 7 ingredients with no bake time. 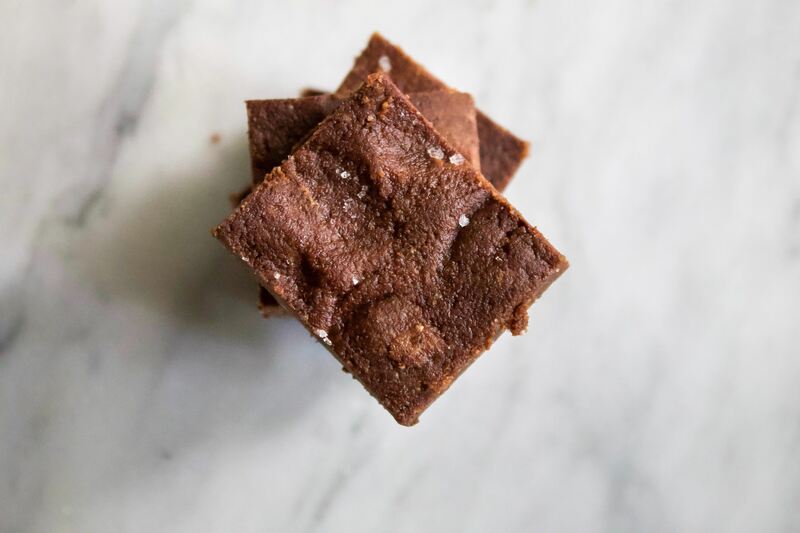 This recipe will be added to my ‘go-to’ list, and the best part is they are vegan, gluten free, and refined sugar free. Wishing you and yours a happy and healthy holiday and I can’t wait to see share another year with you all. Thank you for your continued support! 1. In a large bowl, melt coconut butter (over stove top, or microwave), and whisk until smooth. 2. To the same bowl, add vanilla and maple syrup, then whisk until combined. 3. To the bowl add almond meal, salt, and coconut flour. Mix until smooth. 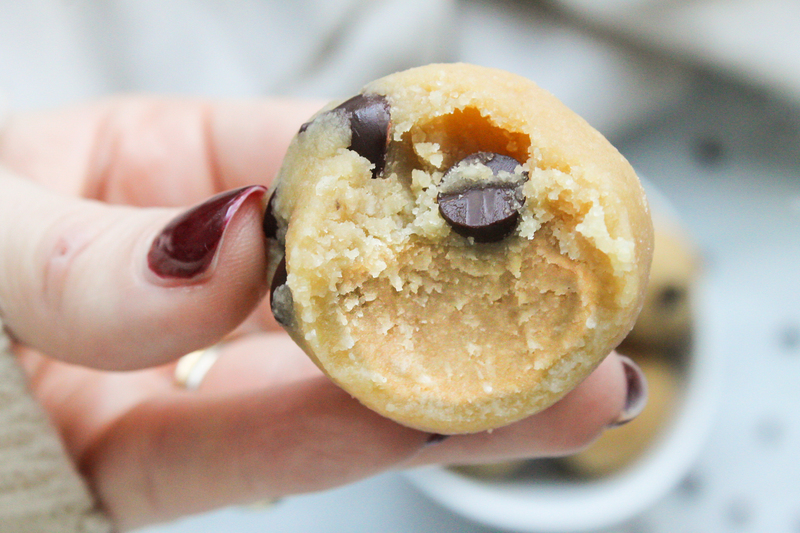 The batter should resemble a real cookie dough. If you find it too wet to roll into balls, add 1/2 tbsp of coconut flour at a time, until desired consistency is achieved. Alternatively, you could add more almond flour until dough is formed. 5. 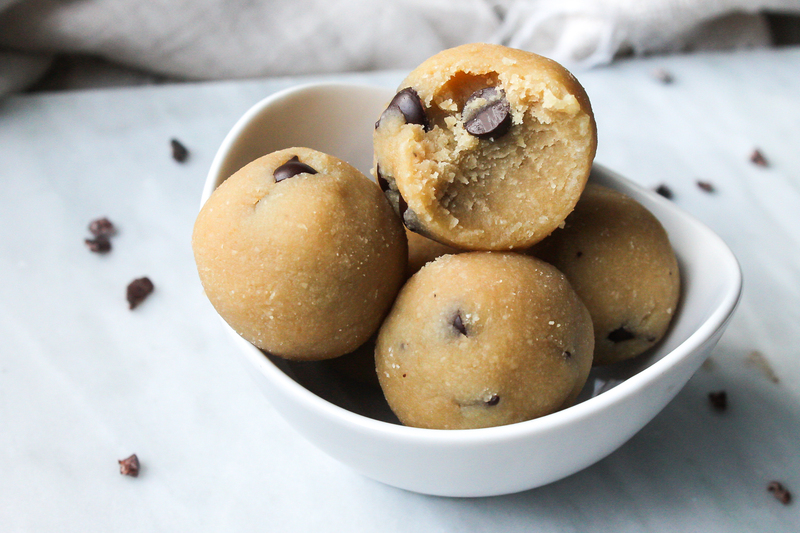 Using a small cookie scoop or tbsp measure, scoop mixture and form into balls. 6. Store in an airtight container in the refrigerator for one week or in the freezer for one month!